Topics: Restricted Master Key Systems, Transponder And Electronic Keys, Insurance, and Website By Brand&profile. It is hosted by Web24 Pty Ltd Virtual And Dedicated Server Colocation (Victoria, Mulgrave,) using Apache web server. The programming language environment is PleskLin. 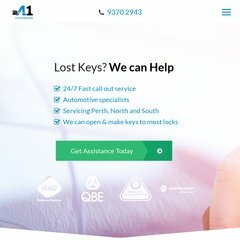 ns.a1locksmiths.com.au are its DNS Nameservers. PING (125.214.65.229) 56(84) bytes of data.